McLarty Daniel Chrysler Dodge Jeep Ram Fiat of Springdale has a 2018 Dodge Charger for sale near Fayetteville, Arkansas. If there was a Mount Olympus for muscle cars, the Dodge Charger would be right up there at the head table with the best of the best. Since 1966, the legendary Charger nameplate has been helping raise heart rates with pulse pounding horsepower and aggressive, muscular styling. That proud lineage continues with the 2018 Dodge Charger. Whether you need a sedate and roomy family sedan or a full-tilt boulevard bruiser, there’s a 2018 Dodge Charger that’s right for you! DESIGN AND COMFORT: Just looking at the 2018 Dodge Charger, you know you’re in for a good time behind the wheel. Low, long and wolfish from any angle, the 2018 Charger features a wealth of old-school muscle car design touches, from the double power bulge hood, to the deep and angular side scallops that recall the legendary second-generation Chargers of the late 1960s. Out back, there’s another retro touch: a modern take on the classic Charger “ring of fire” tail lights, with LEDs that loop from fender to fender, capped with an available three-piece spoiler for more aerodynamic downforce at speed. Inside, the Dodge Charger is all sports sedan, with optional power seats with lumbar and hip support designed to keep you firmly planted even when blasting through the corners, available leather, heated steering wheel, and performance-oriented layout of the shifter, controls and pedals. TECHNOLOGY AND SAFETY: It’s good to be beautiful and fast, but it’s better to be beautiful, fast and smart. The 2018 Dodge Charger achieves that hat trick with some of the best technology and safety features of any vehicle on the road, including a 7-inch digital display in the main gauge cluster, adaptive cruise control which can automatically maintain a set distance to the car in front of you, and an available “Sport Mode” that optimizes the steering, handling, throttle response and shift points for maximum fun when you’re in the mood to carve the corners. Keeping you safe is a full complement of advanced airbags, full-speed front collision warning that alerts you to obstacles in the roadway and can automatically apply the brakes to help you avoid a crash, standard ParkView rear camera piped to the touchscreen in the center stack, and Rain Brake Support, which optimizes traction and braking for wet conditions any time the wipers are turned on. 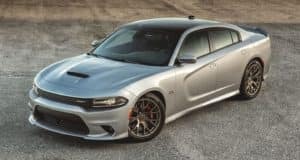 PERFORMANCE AND HANDLING: Dodge Charger has been synonymous with world-beating performance from the beginning, and the 2018 Dodge Charger ups the ante by being able to both go fast in a straight line and shred corners with the best of them. Standard power is the 3.6-liter Pentastar V6, with a respectable 300 horsepower on tap plus ultimate fuel efficiency. For more grunt, there’s the legendary power of the available 5.7-liter Hemi V8, with 370 horses. That should be enough for anybody, but if your need for speed is ever greater, there’s the harnessed rage of the 392 Hemi, with 485 horsepower and 475 lb.-ft. of tire-shredding torque, or the supercharged 6.2-liter Hellcat Hemi, putting out an astounding 707 horsepower. All are backed by a smooth-shifting 8-speed automatic with available paddle shifters, and advanced all-wheel drive to keep you and your passengers sunny side up, even when the going gets twisty. With interior comfort, aggressive styling, high tech safety and connectivity and modern muscle under the hood, it’s no surprise if the 2018 Dodge Charger is your dream car. If so, make that dream a reality today by stopping in for a test drive at McLarty Daniel CDJRF of Springdale! We’ve got the 2018 Dodge Charger in option packages from mild to wild, and can put the keys to you dream machine in your hand before sundown. Are you ready to make driving fun again? Come see us today, or shop our selection of 2018 Chargers online right now! 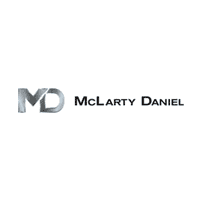 Click here to contact McLarty Daniel CDJRF of Springdale, or click here to visit our finance department. McLarty Daniel CDJRF of Springdale is a new and used car dealership that is proud to serve Northwest Arkansas, including the communities of Lowell, Fayetteville, Tontitown, Rogers, Bentonville, Springdale, Siloam Springs, Bella Vista, Fort Smith and all points in between!